Wikipedia also has a good working definition with photos to help illustrate the execution of the attack. The flèche involves speed and an element of surprise. The flèche is absolutely not a charge down the piste at an opponent at distance. The flèche utilizes timing, not distance, so the distance shouldn’t be greater than an advance-lunge. The flèche is only used in foil and épée. 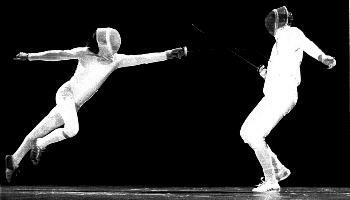 In sabre, it is forbidden for the back foot to pass in front of the front foot, outlawing the flèche. Just in case the definition isn’t enough, at the tail end of the video below is an example of a flèche in slow motion. Enjoy! This entry was posted in Fundamentals and tagged épée, fencing strip, foil, piste, quickness, USFCA on November 7, 2013 by A.B. Schafer. During her high school years, Anita was a competitive fencer primarily fencing in the Midwest and has competed in the Junior Olympics. She brings a wealth of knowledge of techniques, tactics, and strategy to her students. Her focus on self-discipline and self-confidence in class gives her students the ability to succeed both on and off the fencing strip.